The Hilden Manor is a Grade II listed building dating from the 14th and 15th centuries. In 1456, the manor is recorded as having been left in the will of Henry Vane (sometimes written as Fane) to his son, John. Early this century, it became an inn. There was a swimming pool at the back, it was open-air and very cold, but once in you could stay in all day. It had diving boards and a rock fountain and it became a very popular pool. The swimming pool was filled in sometime around the 1960s/70s when a new housing development was built to the rear of the pub (now Stacey Road). 1936 advert from The Courier, image courtesy of Tim Asquith. ​The swimming pool even featured in the dinner-dances that were held there. 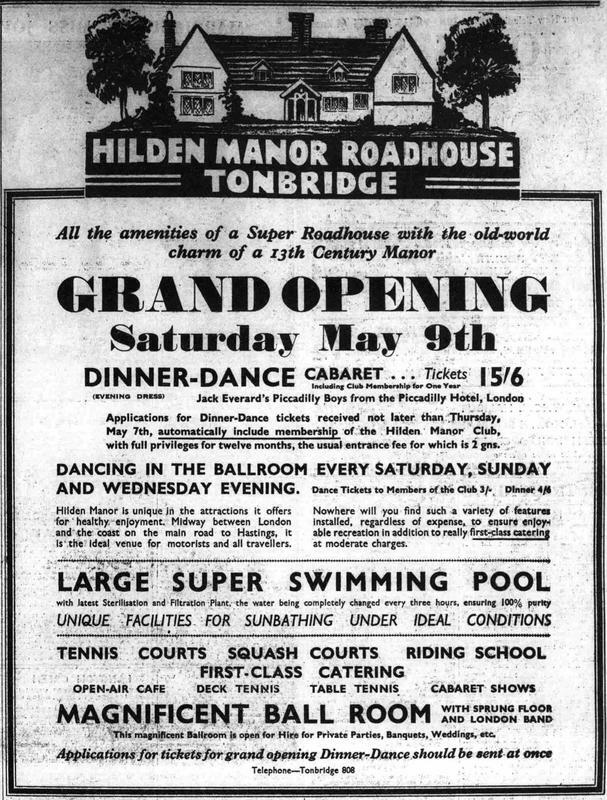 Can you imagine going to a night-club these days, dancing the night away, then going for a midnight swim? These images above and below are from a newspaper advert from 1964. The function room off to one side was very popular and used to host jazz nights, dance classes, weddings, business luncheons and all sorts of functions. There was also a horse-riding academy based here. 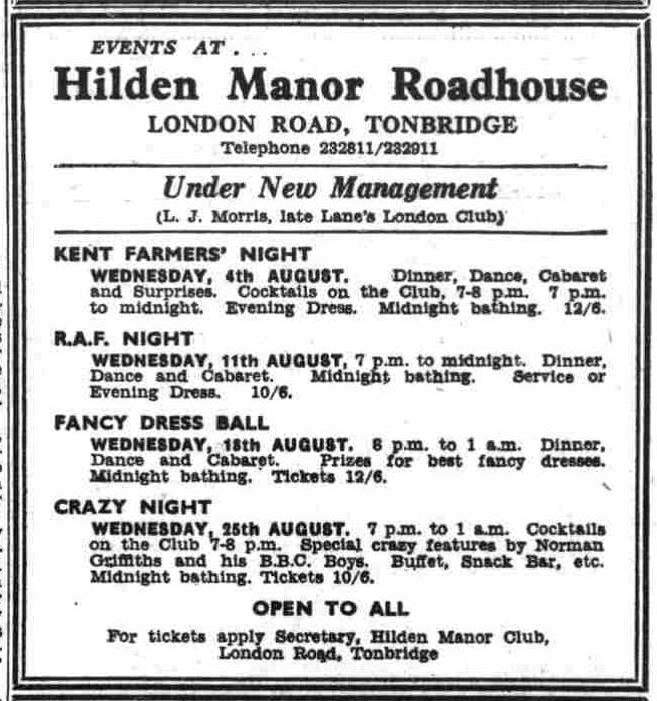 Advert from the Tonbridge Free Press newspaper, 1963. Image courtesy of Trisha Robynns. In the 1970s, Thursday night was disco night with DJ Tony ‘Shades’ Valence, these were very popular and fondly remembered. The Radio Caroline Roadshow, which toured South-East England in the late 1970s, would also pitch up here. ​On Monday morning, February 21st 2005, a fire broke out, apparently in an electrical cupboard. There was a delay getting the correct fire-fighting equipment to site, the fire spread rapidly and gutted the interior, and most of the roof collapsed. The function room was destroyed and was demolished. Repairs were carried out, saving as much of the original timbers as possible. New oak was spliced into old using traditional jointing methods and the original design collar purlin oak roof and crown post was reintroduced. ​As part of the deal to get the pub rebuilt, a new Premier Inn hotel was built alongside.